We can’t even count the number of people around here who grew up thinking they’d become a veterinarian. And why wouldn’t kids want to grow up to be a vet? You get to be a doctor, you get to hang out with animals all day, and you get to bring joy to others. Seems like the perfect profession for anyone. Though most of us don’t grow up to be vets, we can at least let our little ones try it out for dress-up or Halloween. Who knows, they may be the next celebrity vet - caring for all of the pets in Hollywood. It could happen. Does your little girl love to take care of animals? Then she'll love dressing up in this veterinarian costume. She'll feel like she could save every animal when she wears this adorable set of scrubs this Halloween. This is perfect for the vet in training. 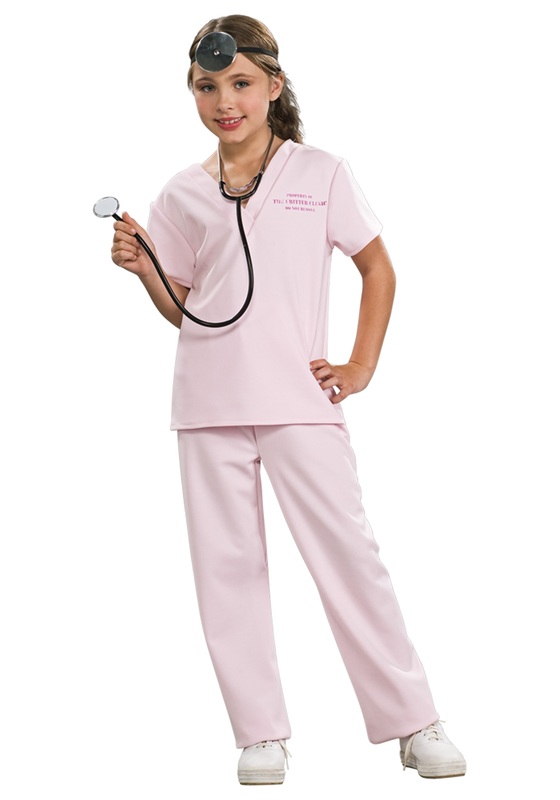 This 100% polyester child veterinarian costume is both comfortable and adorable. The pink polyester shirt and matching pants are the perfect way to start off this costume. The elastic waist of the pants allows for a comfortable fit for all night wear. The pink top has two printed phrases on it “Property of the Critter Clinic” and “Do Not Remove.” That way, everyone will know where her heart really lies - with the animals, of course! Add a stethoscope and other doctor accessories to complete the look.